The red respiratory protein of erythrocytes, consisting of approximately 3.8% heme and 96.2% globin, with a molecular weight of 64,450, which as oxyhemoglobin (HbO2) transports oxygen from the lungs to the tissues where the oxygen is readily released and HbO2 becomes Hb. When Hb is exposed to certain chemicals, its normal respiratory function is blocked; for example, the oxygen in HbO2 is easily displaced by carbon monoxide, thereby resulting in the formation of fairly stable carboxyhemoglobin (HbCO), as in asphyxiation resulting from inhalation of exhaust fumes from gasoline engines. When the iron in Hb is oxidized from the ferrous to ferric state, as in poisoning with nitrates and certain other chemicals, a nonrespiratory compound, methemoglobin (MetHb), is formed. In humans there are at least five kinds of normal Hb: two embryonic Hb's (Hb Gower-1, Hb Gower-2), fetal (Hb F), and two adult types (Hb A, Hb A2). There are two α globin chains containing 141 amino acid residues, and two of another kind (β, γ, δ, ε, or ζ), each containing 146 amino acid residues in four of the Hb's. Hb Gower-1 has two ζ chains and two ε chains. The production of each kind of globin chain is controlled by a structural gene of similar Greek letter designation; normal individuals are homozygous for the normal allele at each locus. Substitution of one amino acid for another in the polypeptide chain can occur at any codon in any of the five loci and have resulted in the production of many hundreds of abnormal Hb types, most of no known clinical significance. In addition, deletions of one or more amino acid residues are known, as well as gene rearrangements due to unequal crossing over between homologous chromosomes. The Hb types below are the main abnormal types known to be of clinical significance. Newly discovered abnormal Hb types are first assigned a name, usually the location where discovered, and a molecular formula is added when determined. The formula consists of Greek letters to designate the basic chains, with subscript 2 if there are two identical chains; a superscript letter (A if normal for adult Hb, etc.) is added, or the superscript may designate the site of amino acid substitution (numbering amino acid residues from the N-terminus of the polypeptide) and specifying the change, using standard abbreviations for the amino acids. There is an exhaustive listing of variant Hb's in MIM in which a composite numbering system is used. /he·mo·glo·bin/ (he´mo-glo″bin) the oxygen-carrying pigment of erythrocytes, formed by developing erythrocytes in the bone marrow; a hemoprotein made up of four different polypeptide globin chains that contain between 141 and 146 amino acids. Hemoglobin A is normal adult hemoglobin and hemoglobin F is fetal hemoglobin. Many abnormal hemoglobins have been reported; the first were given capital letters such as hemoglobin E, H, M, and S, and later ones have been named for the place of discovery. Homozygosity for hemoglobin S results in sickle cell anemia, heterozygosity in sickle cell trait. Symbol Hb. fetal hemoglobin that forming more than half of the hemoglobin of the fetus, present in minimal amounts in adults and abnormally elevated in certain blood disorders. mean corpuscular hemoglobin (MCH) the average hemoglobin content of an erythrocyte. reduced hemoglobin that not combined with oxygen. hemoglobin S the most common abnormal hemoglobin, with valine substituted for glutamic acid at position six of the beta chain, resulting in the abnormal erythrocytes called sickle cells, and causing sickle cell anemia. a complex protein-iron compound in the blood that carries oxygen to the cells from the lungs and carbon dioxide away from the cells to the lungs. Each erythrocyte contains 200 to 300 molecules of hemoglobin, each molecule of hemoglobin contains four heme groups, and each heme carries one molecule of oxygen. 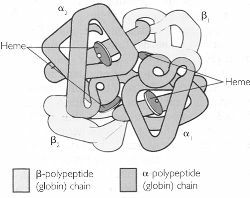 A hemoglobin molecule contains four globin polypeptide chains. Each polypeptide chain is composed of 141 to 146 amino acids. The absence, replacement, or addition of only one amino acid modifies the properties of the hemoglobin. Different kinds of hemoglobin are identified by their specific combination of polypeptide chains. 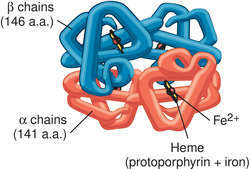 Normal adult hemoglobin is composed of alpha and beta chains. About 2% of adult hemoglobin is composed of alpha and delta chains, called hemoglobin A2 (Hb A2). Fetal hemoglobin is composed of alpha and gamma globin. The normal concentrations of hemoglobin in the blood are 12 to 16 g/dL in women and 13.5 to 18 g/dL in men. In an atmosphere of high oxygen concentration, such as in the lungs, hemoglobin binds with oxygen to form oxyhemoglobin. In an atmosphere of low oxygen concentration, such as in the peripheral tissues of the body, oxygen is replaced by carbon dioxide to form carboxyhemoglobin. Hemoglobin releases carbon dioxide in the lungs and picks up oxygen for transport to the cells. Also spelled haemoglobin. See also carboxyhemoglobin, complete blood count, erythrocyte, erythropoiesis, heme, hemoglobinopathy, hemolysin, oxyhemoglobin. Hb Physiology A tetrameric 64 kD protein that is the major constituent of RBCs, which transports O2, and buffers CO2 produced by respiration; Hb transports O2 and CO2 and which comprises 99% of the protein weight of RBCs; it is composed of 2 α chains, each 141 amino acids in length, encoded from the zeta chain gene on chromosome 16 and 2 β chains, each 144 amino acids in length, encoded from the contiguous eta, Gγ, Aγ and delta chain genes on chromosome 11 Forms of Hb HbF is formed in the fetus and is the major Hb until birth; at birth up to 30% of the hemoglobin is HbA; most adult Hb is HbA with small amounts of HbF and HbA2; Hb defects are inherited and termed hemoglobinopathies. See Carboxyhemoglobin, Chemically modified hemoglobin, Fetal hemoglobin, Reduced hemoglobin. The red respiratory protein of erythrocytes, consisting of approximately 3.8% heme and 96.2% globin, with a molecular weight of 64,450, which as oxyhemoglobin (HbO2) transports oxygen from the lungs to the tissues where the oxygen is readily released and HbO2 becomes Hb. When Hb is exposed to certain chemicals, its normal respiratory function is blocked; thus, oxygen in HbO2 is easily displaced by carbon monoxide, a process that results in the formation of fairly stable carboxyhemoglobin (HbCO), as in asphyxiation resulting from inhalation of exhaust fumes from gasoline engines. When the iron in Hb is oxidized from the ferrous to ferric state, as in poisoning with nitrates and certain other chemicals, a nonrespiratory compound, methemoglobin (MetHb), is formed. An iron-containing pigment of red blood cells composed of four amino acid chains (alpha, beta, gamma, delta) that delivers oxygen from the lungs to the tissues of the body. n a protein-iron compound in red blood cells that carries oxygen from the lungs to body cells. The normal hemoglobin levels in the blood are 12 to 16 g/dL in women and 13.5 to 18 g/dL in men. Red respiratory protein of erythrocytes. In humans, there are at least five kinds of normal Hb: two embryonic Hbs (Hb Gower-1, Hb Gower-2), fetal (Hb F), and two adult types (Hb A, Hb A2). n the oxygen-carrying red pigment of the red blood corpuscles. It is a reddish, crystallizable conjugated protein consisting of the protein globulin combined with the prosthetic group, heme. n a determination of the hemoglobin content of the blood. By the Sahli method, 14 to 17 g/100 mL of blood is normal, and 15.1 Sahli units are taken as 100% for estimation of hemoglobin percentages. an allosteric protein found in erythrocytes that transports molecular oxygen (O2) in the blood. Symbol Hb. Oxygenated hemoglobin (oxyhemoglobin) is bright red in color; hemoglobin unbound to oxygen (deoxyhemoglobin) is darker. This accounts for the bright red color of arterial blood, in which the hemoglobin is about 97% saturated with oxygen. Venous blood is darker because it is only about 20-70% saturated, depending on how much oxygen is being used by the tissues. The affinity of hemoglobin for carbon monoxide is 210 times as strong as its affinity for oxygen. The complex formed (carboxyhemoglobin) cannot transport oxygen. Thus, carbon monoxide poisoning results in hypoxia and asphyxiation. Another form of hemoglobin that cannot transport oxygen is methemoglobin, in which the iron atom is oxidized to the +3 oxidation state. During the life span of a red cell, hemoglobin is slowly oxidized to methemoglobin. At least four different enzyme systems can convert methemoglobin back to hemoglobin. When these are defective or overloaded, methemoglobinemia, in which high methemoglobin levels cause dyspnea and cyanosis, may result. As red cells wear out or are damaged, they are ingested by macrophages of the reticuloendothelial system. The porphyrin ring of heme is converted to the bile pigment bilirubin, which is excreted by the liver. 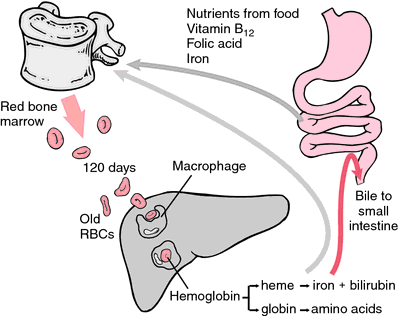 The iron is transported to the bone marrow to be incorporated in the hemoglobin of newly formed erythrocytes. include hemoglobin extraction test, hemoglobin-pseudoperoxidase test. Used on suspect meat to determine if it has been properly bled out; poor bleeding is an indication of fever or septicemia. varies with the hematocrit; determined by several methods. Assesses the oxygen-carrying capacity of blood. hemoglobin A with a glucose moiety attached to the amino terminal valine of the beta chain. This type of hemoglobin is made at a slow constant rate during the life span of the erythrocyte. Increased levels correlate with glucose intolerance in diabetes. With adequate insulin treatment, levels return to the normal range and periodic assays can be helpful in evaluating effective control of diabetes mellitus. Called also hemoglobin A1c. measurement of the percentage of hemoglobin A molecules that formed a stable ketoamine linkage between the amino terminal valine residue of the beta chain and a glucose moiety; used to assess diabetic control. the incremental increase in oxygen saturation of the hemoglobin with each unit increase of the partial pressure of oxygen in the blood. Any factor that shifts the curve to the right will automatically reduce the concentration of O2 held by the hemoglobin and increase the rate of its delivery to tissues. the globin part of hemoglobin is composed of a large number of amino acids and the hemoglobins are therefore susceptible to a great many variations. In humans a large number of variants have been identified but only a few in animals and none are deleterious. The identified ones are the three adult hemoglobin types, HbA, HbB and HbC. There is also an embryonic, HbE, and a fetal hemoglobin, HbF.